Many of my friends and family are amused when I tell them about my YouTube videos. Most of the time I don’t even want them to watch because I feel a little silly. All I talk about is hair so I figure they won’t really get why I do them anyway. As for my YouTube family, there is still so much I want to share. My first video was just to show others how I transitioned from Relaxed to Natural Hair. I was so happy to see all of the positive comments and decided to do update videos to show my progress. With each video, I received questions which ended up leading to another episode. The first time I saw that I had subscribers on my YouTube channel I was shocked. I didn’t really think that I had much more to offer than any other Natural on YouTube. This is what sort of kept me going though. Ever since those first two subbies, I’ve been posting more and more content on my hair journey. I checked to see how many I was up to today and saw that I have a little over 1400 subscribers! I know that there are “Hair Gurus” out there who have waaay more but I am blown away by that number. These are all people who for one reason or another genuinely would like to see more content from lil’ ole me! I wish that I could post more often but my dinosaur of a computer is a real drag when it comes to video editing. Hopefully I’ll be able to push out a couple of vids here soon to feed the masses. 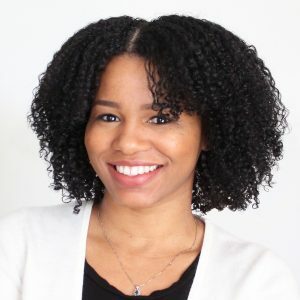 In the meantime, I just hope that my place in YouTubia is a help to someone out there who is looking for more information on how to go natural. I was looking at my hair for the past few months and noticing that my curl pattern had gotten looser. I knew that henna can have this effect so I added amla powder to my last few applications to prevent this from happening any further. After wearing my hair straight twice in December, I was pretty sure that I was experiencing some heat damage. My hair texture is thinner in the front so it always happens there first. The rest of my hair was still curly but not as thick as before. 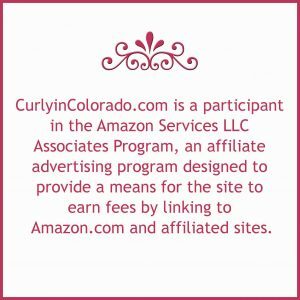 After using my Aubrey Organics GPB conditioner for a couple of light protein treatments, I knew that my hair, although it looked better, still needed a trim. I was due for a trim this month anyway so I figured why not invest in some new sheers. I bought the stainless steel hair sheers by Conair. I was surprised to find them in a kit that also came with a cape…COOL! Instead of flat ironing my hair again, I decided to do the trim on stretched hair. This method showed me that it is possible to do a trim without using heat. I decided to go for it and take off a little more than the usual 1/8″ to 1/4″. I cut a full 1/2″ off of each section! That is a whole months’ growth for me but it was definitely worth it. The result…MY CURLS ARE BACK! I’m so excited because my hair has not been this thick and curly for so long. The bangs are still pretty loose but I’m okay with that. The other thing that decided to join the party is my crazy shrinkage. My hair looks really short since the trim even though it’s still past my shoulders in the back. This is exciting because I didn’t actually have to cut very much in order to get back where I wanted to be. I’m still serious about achieving great lengths with my hair this year. Now, with the trim, I have the healthy ends I need to start things off right. My Dad is a licensed barber and has been cutting other people’s hair since I was very young. He always did cuts and trims for friends and family. I remember when he used to cut my younger brothers’ hair. When they were small he would sit them on top of phone books on a chair in the kitchen. My mother on the other hand was always very good with braiding hair. She taught me how to french braid my own hair when I was 10 years old. Now that I’m Natural, I’m very grateful for learning this technique. My younger brother and I took after my dad and learned how to cut hair for our friends. I did it more as a hobby throughout college and to get practice for when I did my own hair. My brother is currently going to school to become a licensed barber. 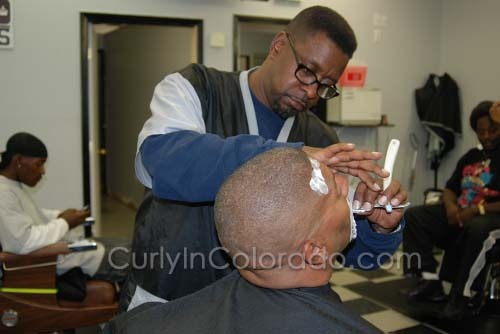 He even participated in a “Barber Cut-Off” earlier this year at a large hairshow in downtown Denver. I am proud to say that he is very skilled at his craft. Now that I have a family of my own, we do things just like when I was growing up. My husband has long straight hair and my boys have short curly fros. Mine is definitely the thickest of the bunch. Still, I manage to somehow keep up with everyone’s individual hair needs. I do all of our trims; curly and straight. My trims are usually once a month. Sometimes I’ll even have my mother over for a trim and flat iron. For me, it’s just always been this way. When it comes to hair, we like to keep it in the family. 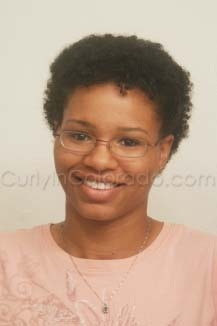 Once I decided to go Natural, I considered how long I should go before doing the Big Chop. At only 3 months post relaxer, I was certain that I wanted to grow my natural texture out a lot more before this step. Normally I wore my hair straight but I was beginning to see how damaging all of the heat was. The next best thing was Rollersetting. I personally had never Rollerset my hair before. I had seen it done in the salon but that was about it. From what I could see on YouTube, there were a lot of ladies who did it each week instead of using flatirons and blowdryers. I also kept hearing about how handy it was to have a hooded dryer at home for this style and to do deep treatments. I figured I would give it a go. I went to my local Sally’s beauty supply and purchased the Ion hooded dryer with multiple heat settings for about $40. When I got home, my husband thought I had gone mad. I explained that it was an investment and that I would get a lot of use out of it. As for the rollersetting, I really didn’t know how it would turn out but it was worth a try. I watched plenty of videos before going for it. I used the small grey perm rods so that the two textures of my hair would blend together better. The end result was a cute and curly little afro. The style often lasted a whole week which meant less stress on my hair. It’s almost 2 years later and I still rollerset my hair. 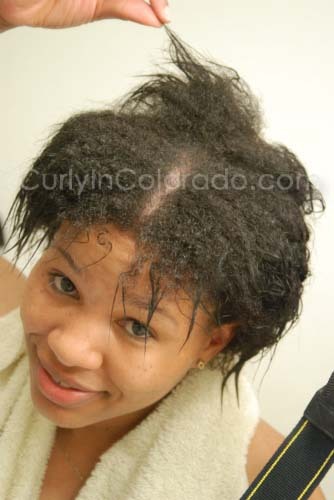 I didn’t realize it then but it’s a technique that can also be used on Natural hair. I’m glad that I learned how to do it during my transitioning phase because now it’s one of my staple styles.